The late news anchor Walter Cronkite, the planet-hunting Kepler space telescope and a hypersonic aircraft mission are among the people and projects being honored by this year's National Space Club awards. The Washington, D.C.-based group announced the winners on Tuesday (Feb. 4). The awardees, who range from science teachers to journalists to spacewalk directors, were selected by panels of experts and are "a testament to the inspiring work of individuals across our nation," National Space Club officials said. The Kepler Team will get this year's top honors: the Dr. Robert H. Goddard Memorial Trophy. In its search for alien worlds, the Kepler space telescope "has revolutionized exoplanet science and stellar astrophysics." Kepler data has allowed scientists detect more than 3,500 planet candidates outside of our solar system. 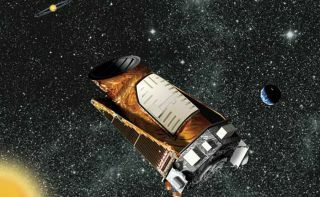 Though the spacecraft, which launched in 2009, is now hobbled after a mechanical failure in May, NASA officials are weighing a new modified mission for Kepler. William Harwood, a space reporter at CBS News and Walter Cronkite, the legendary CBS Evening News anchorman, will be recognized with the Press Award"for their dedication and enthusiasm for space news." Cronkite, who died in 2009, covered the early history of American spaceflight, including 1969's Apollo 11 moon landing. David Korth and the Extra Vehicular Activity (EVA) Console Team at NASA's Johnson Space Center in Houston will receive the Eagle Manned Mission Award"for their ability to recognize hazards, analyze a situation, and recommend appropriate actions while under the immense pressure of a human spaceflight emergency." Korth and his team indeed dealt with a rather harrowing emergency last year; they called off a July 16 spacewalk when water flooded the spacesuit helmet of European Space Agency astronaut Luca Parmitano. Dr. Adam Steltzner, a fellow at NASA's Jet Propulsion Laboratory in Pasadena, Calif., will receive the Astronautics Engineer Award for his "outstanding leadership" heading the team that developed the entry, descent and landing system for NASA's Curiosity rover, allowing the spacecraft to safely touch down on the Red Planet on Aug. 5, 2012. The X-51A WaveRider Team will receive the Nelson P. Jackson Aerospace Award to honor the unmanned X-51A WaveRider autonomous flight demonstrator that is "leading the way to hypersonic flight." During the mission's last flight in May 2013, the craft reached Mach 4.8 — 4.8 times the speed of sound — in just 26 seconds. Lieutenant Colonel Samuel Little, the director of operations at the 45th Launch Support Squadron, 45th Launch Group, Air Force Space Command, Cape Canaveral Air Force Station, Florida, will receive the General Bernard Schriever Award"for successfully leading his squadron as they integrated and launched six Department of Defense satellites, provided Air Force support to three successful Falcon 9 rocket launches and piloted the groundbreaking Global Positioning System III pathfinder satellite." Dr. Darrell Zimbelman,an Air Force civilian and director of the Department of Defense's Electro-Optical System Program Office, will receive the Dr. Joseph V. Charyk Awardto recognize his role in reviving the Director of National Intelligence's top priority intelligence program after a two-year hiatus. Dr. Craig Ferguson, a research associate at SUNY Albany's Atmospheric Sciences Research Center will receive the NOAA - David Johnson Award for his work determining whether weather and climate models correctly represent land-atmospheric coupling states. Brian Grigsby, a science teacher at Shasta High School, Redding, Calif., is the winner of this year's Space Educator Award "for his work in inspiring, educating and developing the next generation of students in space science." Emily Briere, a college junior studying mechanical engineering at Duke University, is the winner of the Goddard Memorial Dinner Keynote Scholarship and will serve as the keynote speaker at the awards dinner. Michael Lotto, a student from the University of Colorado, Boulder, will receive the Goddard Memorial Scholarship to help fund his studies in bioastronautics. His work is aimed at developing future spacewalking suits and hardware that would allow humans to continue working in space and perhaps even explore other planets. Moira Miller, a student at Washington-Lee High School in Arlington, Va., is the winner of the Olin E. Teague Memorial Scholarship. As an intern at NASA's Goddard Space Flight Center, she prepared a presentation for the Lunar and Planetary Sciences Conference 2014.